Pictured left to right are Pat Kahler, Mayor Woody Jacobs Jacobs, Rhonda Van Zandt and Linda Kuykendall. CULLMAN – On Wednesday, Sept. 12, Cullman Mayor Woody Jacobs officially proclaimed the week of Sept. 17-23, 2018, “Constitution Week” in the city of Cullman. On Sept. 17, 1787, the delegates to the Constitutional Convention met to sign the U.S. Constitution. Sept. 17, 2018 marks the 231st anniversary of this historic event. The tradition of celebrating the signing of the U.S. Constitution goes back to 1955 when the Daughters of the American Revolution petitioned Congress to set aside Sept. 17-23 each year for the observance of “Constitution Week.” Congress adopted the resolution and it was signed into Public Law 915 on Aug. 2, 1956, by President Dwight D. Eisenhower. The goal of “Constitution Week” is to emphasize citizens’ responsibilities for protecting and defending the Constitution and preserving it for posterity, to inform the people that the Constitution is the basis for America’s heritage and the foundation for the American way of life, and to encourage the study of the historical events which led to signing of the Constitution in September 1787. Members of the Daughters of the American Revolution, Sons of the American Revolution and the Children of the American Revolution commemorate “Constitution Week” each year by ringing bells, flying flags, reading and helping others become more acquainted with the Constitution’s true contents and offering prayers for our country as the people of Philadelphia did on the day the Constitution was signed. “I encourage people to read and understand our U.S. Constitution and the history of how it was created by our founding fathers,” said Jacobs. 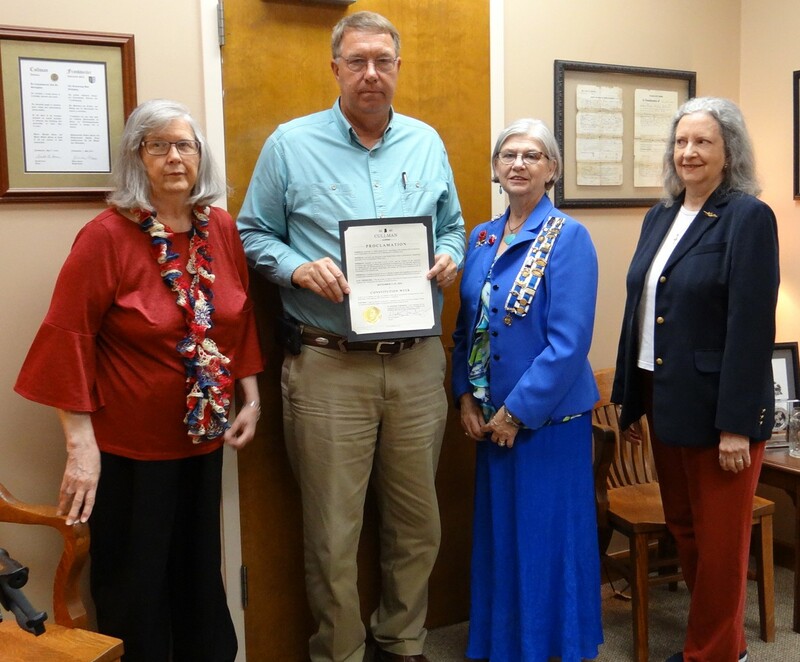 Patricia Kahler, Rhonda Van Zandt, and Linda Kuykendall, members of the Dripping Springs Chapter of the Daughters of the American Revolution, were present to receive the official proclamation from Jacobs. To learn more about the U.S. Constitution and other historical documents, visit www.archives.gov.